It’s a Tuesday evening in late March, and the cold still slings to the air, Toronto is bursting with impatience after a long winter. Tucked into a quiet, warm space in the heart of Kensington Market is the Red Pepper Spectacle Arts headquarters, only separated from the busy side street by a wall of glass. Inside, steps down from street level, Veronica Johnny talks to the circle of 15 women, who each hold a drum in their hands. They are all here to participate in a hand-drumming circle organized by Native Women in the Arts, a non-for-profit located in Toronto. Johnny, of Cree and Dene descent, is from Fort Smith in the Northwest Territories, and is a known contemporary and traditional Indigenous hand-drummer and leader. She is tall and bright in spirit, and commands the room with a loud voice and natural charisma. She is telling the circle of how the song they are about to sing came to be. It was many years ago – in 2009, she thinks – and she was visiting her home in the Northwest Territories to meet with a group of youth. The community had just experienced a high death rate that year, and Johnny asked them if they wanted to ‘catch’ a song in their honour. A song, she says, is never written, it is received by spirits who give it life. They called it “Young Light”, and she began thumping her drum with her mallet as she stood, the rest rising to join her. The sound of 15 drums fills the small space and vibrates through hands, arms, chests. “Eh hey ehey-ya. Waya heya ehey-ya!” they sing, quiet at first but voices rising as the song repeats over and over and beats become more confident and bodies loosen, some closing their eyes and others rhythmically shifting feet. Johnny cuts the tempo and now pauses between thumps, catching some off guard but they soon join in again. “Way ya-way hey hey-ya,” they sing slowly, hips swaying. The pace picks up and they are again chanting the faster verse, and the women are beginning to smile. Hand-drumming circles are a regular occurrence in Toronto, and on any given night there is a circle formed somewhere around the city. Drumming, singing and dancing have been intertwined into the social and political fabric of Canadian Indigenous communities for generations before European colonization, or ‘contact’, and remain an essential part of life for many Indigenous people today. Circles and events that center around the drum bring people together to celebrate a history and culture that has withstood persecution, cultural genocide and a near-erasure of knowledge and way of life. Many nations believe song and dance are sacred, and the drum beat itself is often referred to as the heartbeat of Mother Earth. There are at least 70 different nations across Canada, and with differences in geography and environment each have their own stories, songs and traditions that reflect their histories and beliefs. It is therefore nearly impossible to accurately describe the function and importance of the drum for every community, as language and music style varies wildly from each region to the next. Two drums that are most commonly used by Indigenous people today are the small frame hand drum and the large powwow drum that is played by multiple people in a group. Both are often hand-made with animal hide and wooden frames, and are sometimes painted or decorated with sacred items. Many Indigenous stories, though not all, tell some variation of the drum being given first to the woman by the Great Spirit, who tells her to share it with men to create peace between warring nations. In this way, the drum is often seen as possessing a feminine spirit, and shares a likeness to Mother Earth who is thus treated with care and respect. But despite a respect for the drum and its feminine spirit, the woman’s place at the drum continues to be challenged. For decades there has been much discussion of the gender politics surrounding the big drum, with some groups expressing their belief that the powwow drum should only be played by men, and that it is the woman’s place is to stand behind them and sing. Many think this attitude dates back to the time of European contact, when (in their view) traditionally equal Indigenous communities were taught that women deserve less rights and respect. Whereas the single hand-drum is more commonly used by women, there are still some communities, especially in more remote regions, who disapprove of women wielding any drum at all. 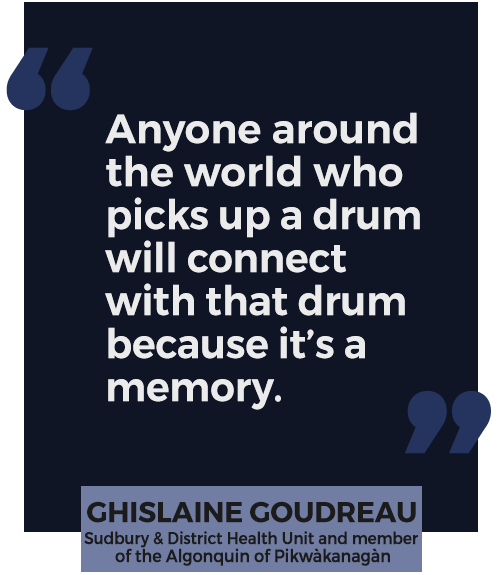 Pushing against these opinions, since the 1970s there has been what many are calling a revival amongst women who have begun to form their own drum circles across Canada. The diversity and cultural freedom of urban centres in particular has made the formation of these circles increasingly possible, and hand-drumming circles, which are often inclusive to all genders (depending on the host) usually contain a mixture of multiple nations from across the country as well as many non-Indigenous people. Government centres and non-for-profits regularly host weekly drum circles. The Native Women in The Arts and Native Women’s Resource Centre of Toronto is open to anybody who identifies as a woman while the Native Canadian Centre of Toronto holds regular circles that is inclusive to everyone, whether or not they own a drum or are of Indigenous heritage. This openness, says Johnny, is important to make connections and to help non-Indigenous people understand the context of Canada’s Indigenous peoples. The evening was coming to an end and the women began packing their drums away, wrapping them in blankets and leather to protect them against the subzero temperatures. Some sipped tea and chatted while others exchanged numbers and planned to meet again at the next event. Johnny remained in her seat in the circle, well-wishing all those who came over to thank her.